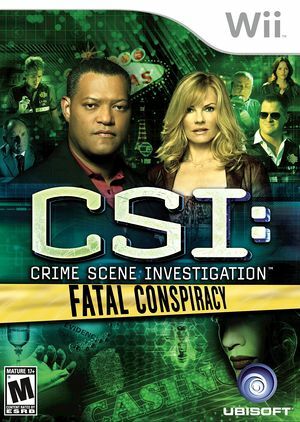 CSI: Crime Scene Investigation - Fatal Conspiracy features five new connected cases written by the same writers from the television series CSI: Crime Scene Investigation. Players will experience an authentic crime-solving video game with real CSI characters, heart-pounding interrogations and enhanced graphics. A unique story structure that unveils the truth piece by piece brings a new level of suspense and intrigue to the top-selling franchise. Hangs and other in game oddities occur when using dual-core mode. Videos have odd corruptions, typically thin lines of scrambled video. The graph below charts the compatibility with CSI: Fatal Conspiracy since Dolphin's 2.0 release, listing revisions only where a compatibility change occurred. This page was last edited on 29 January 2018, at 06:17.